American roulette offers the worst odds available out of the possible roulette variants, so we advise opting for French or European roulette titles where possible. We detail why American roulette has such a high house edge, and where to find alternative variants which are more favourable to the player. 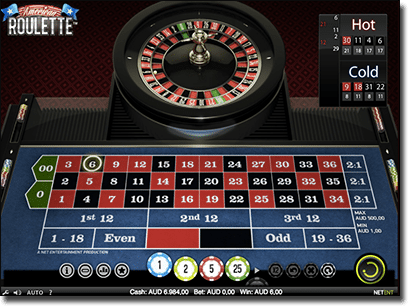 American roulette is based on a standard game of roulette featuring a wheel, a ball, and a table layout for players to place their bets. Once players have made their wagers, the wheel is spun and the outcome is determined. Online variants mimic land-based titles with a virtual table to place your bets. Players simply click on the chip size and then on the table to confirm bets. The wheel, running on fair Random Number Generator (RNG) software, will spin to determine the outcome. The result is announced clearly and your casino account will then be automatically paid accordingly. There are plenty of American variants available at both land-based venues and online, but we recommend avoiding any titles with these rules in play as they offer the worse house edge. Read more about why single zero roulette is better than double zero roulette. This is due to the wheel having an extra numbered pocket. Instead of just the single zero, it also features a double zero – as well as the standard 1 to 36 numbered pockets. This means instead of 37 numbered pockets, there are 38 and while it doesn’t seem like a lot, it almost doubles the house edge to a whopping 5.26%. As mentioned above, the American roulette wheel has single-zero and double-zero pockets, along with the numbers one through 36. Numbers are red or black with the exception of the two zero pockets, which are green. The layout of the wheel is as follows: 0, 28, 9, 26, 30, 11, 7, 20, 32, 17, 5, 22, 34, 15, 3, 24, 36, 13, 1, 00, 27, 10, 25, 29, 12, 8, 19, 31, 18, 6, 21, 33, 16, 4, 23, 35, 14, and 2. Which roulette variant is best? If possible, always opt for European or French roulette due to the low house edge of each of these variants. Both feature just 37 pockets, and the removal of the double zero sees European roulette featuring a 2.7% house edge. French roulette is even less due to favourable rules to the player at just 1.35%. These rules include the En Prison and the La Partage both working with the single zero. Therefore, always opt for French or European roulette if possible. If you have no other choice but to play American roulette, you will want to know how to play to the best of your ability so not to increase the house edge further. Additionally, while the house edge may be higher, the bets are still the same, minus the favourable bets you find in French roulette and one inside bet you can make with American roulette. As mentioned above, there are 38 numbers on the roulette wheel and as such the table layout features a 0 and 00, which are both green, while there are 18 red numbers and 18 black numbers. The 0 and 00 are situated on the top of the three rows beginning with the numbers 1, 2 and 3. The three rows of numbers are considered to be the inside of the layout. While we can’t stress enough to always opt for European or French roulette over American roulette, if you do want to see how it compares we recommend playing at a secure online casino to protect you personal and financial details.